Nothing hits the spot like a warm creamy soup on a snowy winter day. We’re experiencing our first snow of the season today but all is well here. I’m cuddled on the couch with my sleeping toddler, my knitting nearby and a bowl of soup. Perfect. I actually made this soup on accident. I was just boiling up some carrots in chicken stock (we’re doing the GAPS intro diet right now). I thought it would be yummy pureed into a soup and I couldn’t resist a big dollop of cream. So good! Only 4 ingredients so it doesn’t get easier than this. Place stock and carrots in a medium saucepan and bring to a boil. Simmer for about 30 mins or until the carrots are very soft. Remove from heat and puree with an immersion blender right in the pot or in a blender. Add salt to taste. Serve with a generous dollop of sour cream. This also tastes great if you add a bit of leftover shredded chicken or beef pot roast and a splash of hot chili sauce. Part of Sunday Night Soup Night. 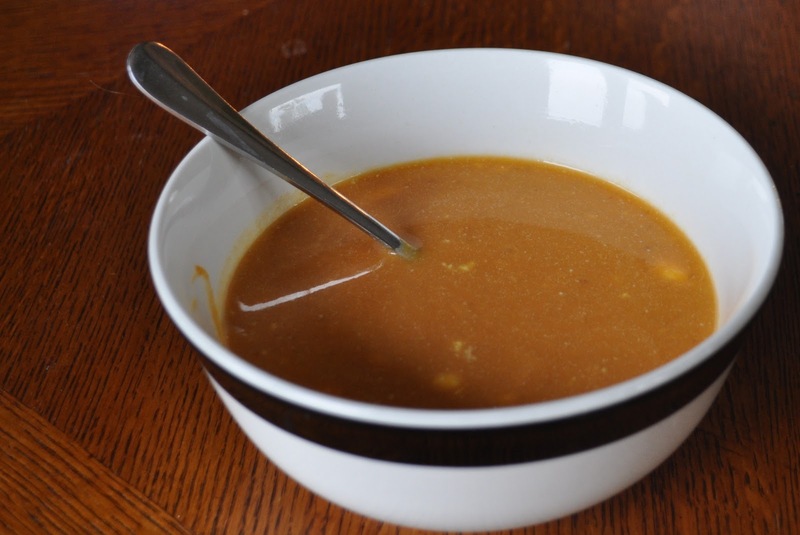 What a wonderfully simple soup! I think the sour cream is a stroke of genius! Thanks for sharing this with Sunday Night Soup Night, look forward to seeing you again soon!